The immortal Mae West once said that “too much of a good thing can be wonderful.” When it comes to pain relievers, however, too much of a good thing can kill you. Which brings us to the sad saga of Anthony Sapko, who died of an accidental prescription drug overdose in August of 2006. Sapko worked as a policeman for 21 years in New Haven, CT, and went on in the mid-1990s to become a state corrections officer. Beginning in 1999, he was treated for depression. He suffered four work-related injuries while working in corrections, the last being a back problem from which he never returned to work. Sapko was treated with a cornucopia of medications: oxycodone, Zanaflex, Kadian, Celebrex, Roxicodone, Avinza, Lidoderm patches and Duragesic. When his depression deepened in 2006, his psychiatrist prescribed Seroquel. Two weeks later, Sapko was dead. The autopsy revealed a level of oxycodone 20 times normal, and of Seroquel at 5 times normal. The combination of the two over-consumed drugs proved both toxic and fatal. Sapko’s widow filed for workers compensation death benefits. The claim was denied at the Commission level and again at the Appeals Court level. Sapko’s widow argued that the death was directly related to his workplace injuries, but the court found a disconnect: this was not a suicide (where such a link might be established), but an accidental overdose. 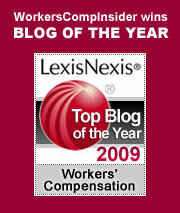 In a December 2011 blog, we made note of two similar cases: a compensable case in Tennessee and a denied case in Ohio. Fatal overdoses, in other words, may or may not be compensable, depending upon the specific circumstances and state-based precedents. But the over-arching issues are clear: the abuse of prescription narcotics has reached epidemic proportions in workers comp; some individuals are unable to properly self-manage the use of these medications; and doctors are all-too-too willing to prescribe very powerful drugs to alleviate pain. Workers compensation is endlessly fascinating because it inevitably brings together pain (from workplace injury) and pain suppression (far too often, opioids). In Sapko’s foreshortened life, the combination of medications was toxic. In workers comp as a whole, the mixture of pain and drugs is proving to be a formidable problem. One of the interesting sidebars in this case is the concept of wilful misconduct: when an injured worker abuses prescription medication, is this a “serious and wilful” action that precludes compensability? Or is the pain so consuming and the drugs so powerfully addicting, that the concept of “wilful” disappears in a drug-induced haze? There are no simple answers. There is undoubtedly some link between Sapko’s depression, the work he performed and the injuries he suffered. But in the world of comp these links must be explicit and, unlike life itself, unambiguous. It would require a novelist to reveal the connections. Unfortunately for Sapko’s widow and children, the commissioners and judges in charge are simply not in a position to craft that kind of narrative. This entry was posted on Monday, June 11th, 2012 at 10:22 am	and is filed under Compensability, Disability, Medical Issues, State News. You can follow any responses to this entry through the RSS 2.0 feed. You can skip to the end and leave a response. Pinging is currently not allowed.